NYC-based Celadon Group has added a new and groundbreaking Danish light fixture to its line of lighting products. Designed by commercial designer and lighting designer Esko Schmidt-Sorensen, the Radius light fixture draws inspiration from the celestial bodies of our ancient solar system. A Best in Class light fixture made of very light-weight aircraft-grade aluminum and characterized by five radial bands illuminating towards a bell shaped center core, the Radius seamlessly integrates quiet yet a kind of retro-futuristic elegance with key eco friendly paints and other materials that are both recyclable and durable. Using the latest hi-efficiency LED technology, the Radius’ bands are carefully calibrated to minimize shadows, creating a truly indirect yet breath-taking lighting source emitting 600 watts of the latest in long-life LED-light power using less energy than a 150-watt incandescent bulb. The Radius weighs less than 20 pounds but is over 31″ diameter and 28′ high. Danish engineer and designer, Esko Schmidt-Sorensen took five years to develop a way to capitalize on LED which until now, has not been exploited much for decorative lighting. The Best-in-Class result, inspired by celestial cycles and Danish lighting heritage, is a light fixture is made of suspended ‘floating’ bands orbiting an hourglass center core. A marvel of engineering that looks forward to new and ecologically minded technology. 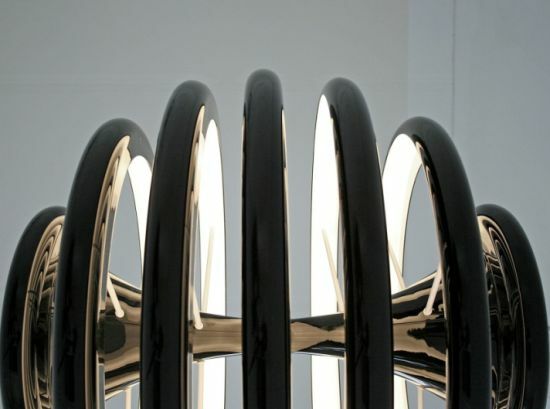 The Radius is represented by ELA and Philips/Lightolier for nationwide distribution and is carried by top showrooms, such as Lighting by Gregory in NYC and Lightology in Chicago and Interior Illusions in Los Angeles. Several of them have been acquired and installed in 8tallet, the dramatic new apartment complex outside Copenhagen, designed by NYC’s Durst Group favorite Architect, BjarkeIngals.